With as crazy as the moving process can be, it is best to stay organized and on top of everything involved. To do this, it is suggested that you create a list of things to get accomplished way before moving day nears. Then as you get them done, check them off or cross them out. This list should include many crucial aspects, as well as more personalized moving day prep. This list can be as long as it needs to be. 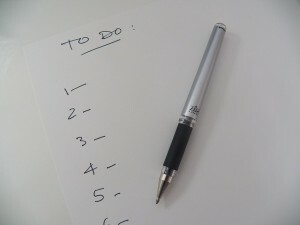 Keep it detailed and add whatever tasks you must get accomplished down on the list as they come about. Keep this list on you at all times. As you get something done, scratch it off and move onto the next task. Do this until everything is completed. It will only make you feel accomplished as you get everything done. The entire moving process will go along much smoother when you are properly prepared for it. To ease up a lot more of your time, you can purchase the full service packing through the moving company. This requires the movers to pack up all of your belongings. They will come in a few weeks or so before the move to package up all items with the latest in moving supplies. They will label all of the boxes and even create an inventory list.